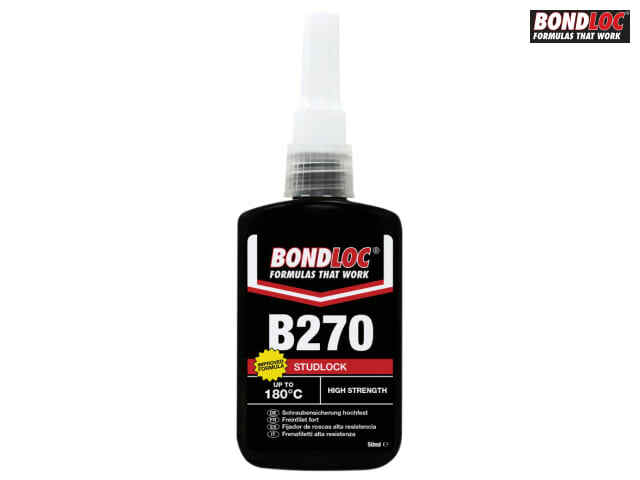 Bondloc B270 Studlock is a permanent green coloured general-purpose adhesive for permanent threaded assemblies. 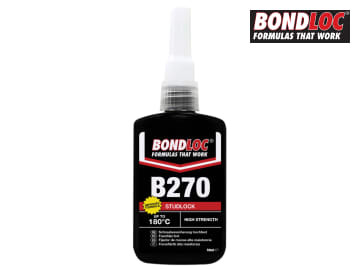 B270 locks studs up to 1in, sealing against leakage and corrosion. It is chemical-resistant, resisting fuels, lubricants and most industrial liquids and gases. It eliminates double nutting and/or welding of critical assemblies. It also permits reduced casting thickness and ultimate lightness, reduced assembly stress and eliminates cracked castings due to interference fit stresses. Fixture Speed No Activator: 10 mins. Fixture Speed With Activator: 5 mins. Shelf Life :12 month min. Max Operating Temperature: -55°C to + 150°C. Full Cure Time: 12 hours. Cure Time with good % of final strength: 2 hours. Typical Breakaway Strength DIN : 40 N.m (25/55). Typical Prevailing Strength DIN : 55 N.m (45/70). Typical Breakaway ISO 10964: 26 N.m (16/36). Typical Prevailing ISO 10964: 36 N.m (22/50).